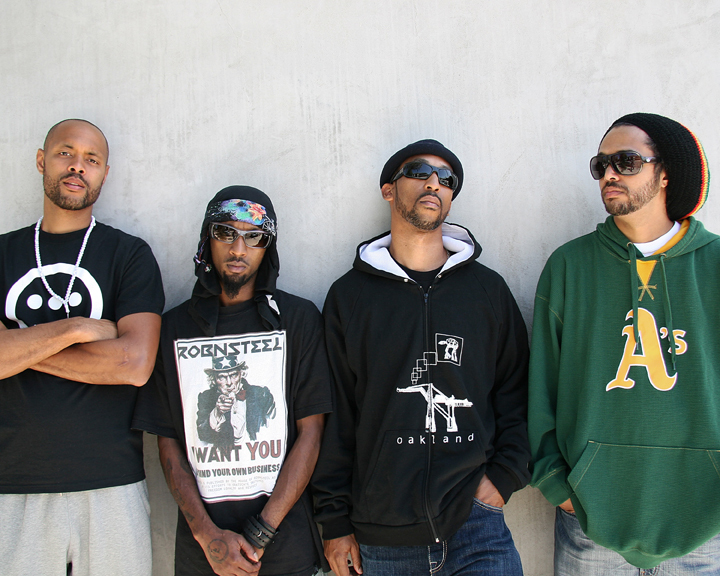 Souls of Mischief has been one of the major architects of the Bay Area sound in rap music since the early ‘90s. “93 til Infinity” off of their debut album shot the group to meteoric success on the national radio charts and got them booked all over the world for concerts. After leaving their label, Jive, Souls of Mischief not only left as the kings of “backpacker” hip hop, they were also cyber-pioneers, being some of the first in the genre to bank on pushing their independent music careers through the internet – and succeeding. Today, the group is part of one of the Bay’s biggest independent rap empires, Hiero Imperium, which has released music from Del the Funky Homo Sapien, Hieroglyphics, Souls of Mischief, Pep Love and Casual, among others. 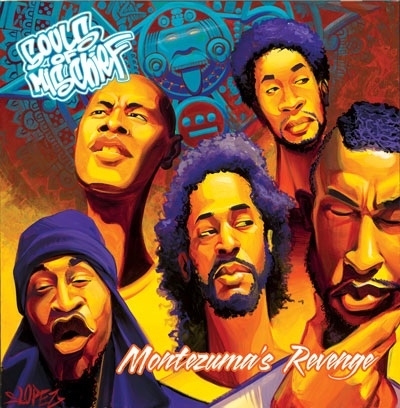 Let’s hear what Tajai, one of the four members of Souls of Mischief, has to say about their newest release, “Montezuma’s Revenge,” and Hiero business in general. M.O.I. JR: Let’s go back in history. How did you start rapping, Tajai? And how did Souls of Mischief and Hieroglyphics come together? When was this? Tajai: I started rapping because my best friend, A-Plus, and I were into hip hop and rapping was the only free thing we could do. Djing was too costly, we were little kids, so graffiti was not an option, and I am not a great dancer. Thus MC it was. I started rhyming at age 8, in 1983. So I have been rapping for 27 years, professionally for 17 years. We (Hiero) all grew up in East Oakland walking distance from each other. We all had a mutual interest in hip hop, so we began to clique up in junior high. When Ice Cube signed Del, Del put us all on. M.O.I. JR: Souls of Mischief changed the sound of what people thought came out of Oakland. Was that intentional? Tajai: We grew up with the concept of being original at the core of hip hop. Almost all artists came out sounding different, and if you didn’t, you were a sucker MC. Thus we were intentionally trying to be different from everybody, not just from Oakland rappers. M.O.I. JR: Why did Souls and Hiero go independent? What has made you guys as successful as you have been online? Tajai: We got dropped from our labels, and Domino had the foresight to get us in the studio instead of trying to go back to the label sharecropping system. Once the product was done, we hit the streets instead of begging labels to validate our music. I think our success comes from the fact that we are accessible. Plus we were online about five years before the internet even started bubbling outside of colleges etc. Thus we could connect directly with our fanbase and book shows, find out what they want and tailor-make campaigns for our products. This all seems like regular everyday business now, 15 years later, but back then it was pretty revolutionary. To this day, our fans give us crazy support. We dropped a limited-edition shirt yesterday and it sold out in hours. M.O.I. JR: Has going independent affected your sound? What kind of equipment do you guys use in the studio? Tajai: There is so much more access to good sounds and equipment now, so technology has made it possible to expand our sound. However, digital sounds are kind of crispy and not as muddy as when we were recording on 2-inch reels. Sometimes we dump music back down to tape reels to get that dirt back. But we basically use a Mac, Protools, SP1200, MPC2000, Nord Leed, Moog, ASR10, Reason and a really good mic and compressor. M.O.I. JR: Is it harder to serve an international audience being independent artists? Is the extra money you make on the indie level worth the extra time that you have to put into your career? Tajai: Absolutely not (harder). Much easier because of no label politics. We can put distro deals in place in every region and get checks from them all! Indie is worth it for us because we had the major startup, so we had millions in fans before going indie. I don’t know if it is the best route for bands who are starting out and need exposure. M.O.I. JR: What has made the Hiero brand as recognized as it is? Tajai: Our logo, period. It is recognized worldwide, from Asia to South America and everywhere else. M.O.I. JR: Can you tell us about the new Souls of Mischief album? What makes it different from past works? Tajai: The new Souls album is great. It was produced mainly by Prince Paul (Stetsasonic, De La Soul, Gravediggaz, Handsome Boy Modeling School) and also has tracks by Domino, A Plus and Opio. This is the first time we let an outside cat run the show. He gave us exactly what we needed. Ask the fans! M.O.I. JR: Recently everybody from Souls except Phesto have released solo albums. What’s going on internally? Tajai: Phes is finishing his up. Since we are indie, we can put out whatever we want, so we exercise our creativity on the solo tip. No breakups or anything though. Our camp is the same as it always has been. M.O.I. JR: Can you talk a little bit about your imprint, Clear Label Records? How does the music you put out through it differ from Hiero Imperium? Tajai: Clear Label Records is an indie. I started to expose people to all of the good stuff available out here, not just “backpack rap” or even just rap. It is my way of bringing the next generation of musicians into the game and making their path easier than mine. My deals are straightforward, and I am accessible to all my artists. Plus with the partnership I have with PTB (ClearBeat); I have access to the hottest street cats too. Thus I have artists like League510, FAMSYRK, Baby Jaymes, Chris Marsol, Deep Rooted and JC on my label, plus Beeda Weeda, D-Lo, Shady Nate, Sleepy D, G-Wett, Dj Fresh and hella others. I only stress quality, not type of music or content. M.O.I. JR: What’s up with the rest of Hiero? M.O.I. JR: Where is Hiero going in 2010 and beyond? When is the fashion line coming out? Tajai: We want to keep dropping good music. That is the base of our business. Plus we have some gear coming: jeans, New Era fitteds, backpacks – hey, we’re backpackers, right?!? – and some other top-secret items in store. We just want our fan base to grow as it has, continuously. M.O.I. JR: How do people keep up wit’ y’all online?